It’s no secret that we love sectionals – The Find is full of beautiful sectionals of varying size, scale, configuration, and so many fabric options. And while you may assume that only a large room can pull off a great big sectional, we’re here to tell you otherwise. Here’s how to design a small space with a big sectional. One of the big (and obvious) benefits of a sectional sofa is all that room. You really can comfortably seat a crowd, even in a smaller space, which makes it perfect whether you’re hosting a get-together or cozying up for a family movie night. Now, when it comes to making that smaller space more efficient in terms of seating – while also creating a cozy, welcoming vibe – the secret isn’t a few small pieces. It’s bigger furniture. The key is in nailing both the scale and the configuration. A lower-profile sectional tends to work well in smaller spaces, especially if you’re dealing with a wall or two of windows, or the back of your sectional will be visible with a walkway behind it. It’s a visual trick that creates a sense of space, even though more floor space is actually covered by the sectional itself. Fabric and color scheme will also impact the overall effect. Going for light and bright? Let that guide your choices. 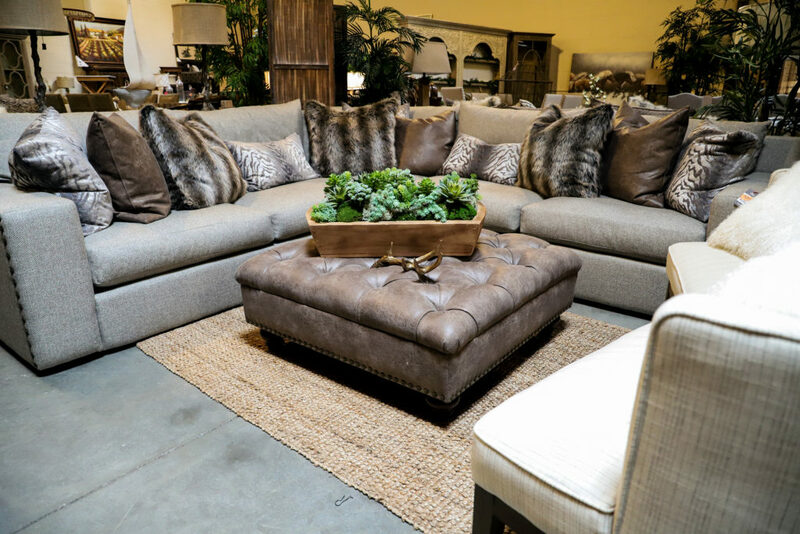 A round coffee table – or a really great ottoman masquerading as a coffee table, a look we love – also makes floor space feel maximized and offers a sense of balance, no matter how it far it gets from the sectional’s corner spot. Surprisingly, odd-shaped rooms or those with limited wall space often lend themselves beautifully to the right sectional. If the idea of adding a sectional to a smaller space in your home feels out of reach, we can help! At The Find in Reno, we offer complimentary space planning. Bring in your measurements, and we’ll help you find a sectional that will work perfectly. Come in Thursday, Friday, and Saturday, and let us help you pull off a big sectional in a small space.